Many court decisions regarding employment discrimination are handled by the courts, based on what is known as Case Law. you can read about the definition of Case Law on Wikipedia at this link. For those of you who would like to research the current state of Case Law regarding your favorite subject, there is bad news. Most Case Law is published by private companies that try to squeeze the most bucks out of what is essentially, public property. Most attorneys are using services like LexisNexis, that restrict access to a paid subscription audience. 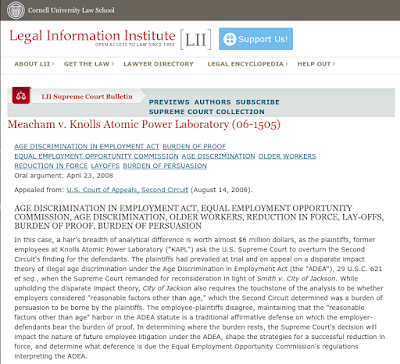 Luckily, Cornell University Law School has come with their own solution to provide a (free of charge) public access Case Law service, which is available at: Legal Information Institute. The idea behind doing your own research is not necessarily to save on hiring an attorney to handle a potential legal case, but rather to be informed before consulting with an attorney, and being able to determine if they are competent enough to serve you in seeking a set goal. While an attorney spent more time than you studying the law, you are more familiar with specifics of your case and your work environment. By complementing your knowledge with legal background information you will be able to ask more relevant questions and even challenge the assumptions that an attorney makes, because they don't really know how your situation before investing time in investigations. Below is a screen shot of one of my query results. I encourage everyone to poke around in this site, discover the capabilities and share with the rest of us. For those of you who have HDHP medical coverage, I suggest making out of pocket contribution to your HSA for the balance of the year, when paycheck deduction will not occur. This will reduce your tax burden for 2016, as well as preserve a larger portion of your gross income for a worthy cause (paying for future medical expenses and insurance premiums). As an affected employee in an employment discrimination case you may find yourself swimming in a maze of legal acronyms that are even more convoluted than the ones you encountered during your years of service at Intel Corp. Note that EEOC law enforcement actions are based upon a collection of executive orders and laws passed by congress. To make some sense of the legal framework associated with employments discrimination I listed references to the actual legal documents, together with the most common acronyms. The links provided below are organized in historical order. Click on each link to review the relevant document. 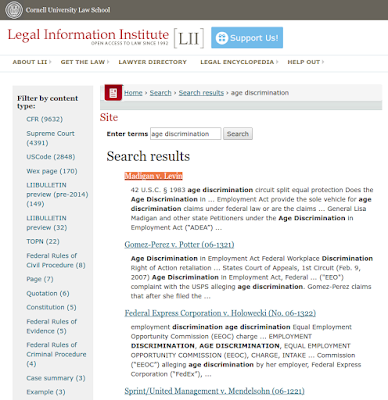 In addition, there is a series of U.S. Supreme Court decisions that provide guidelines for lower courts in cases involving employment discrimination cases. 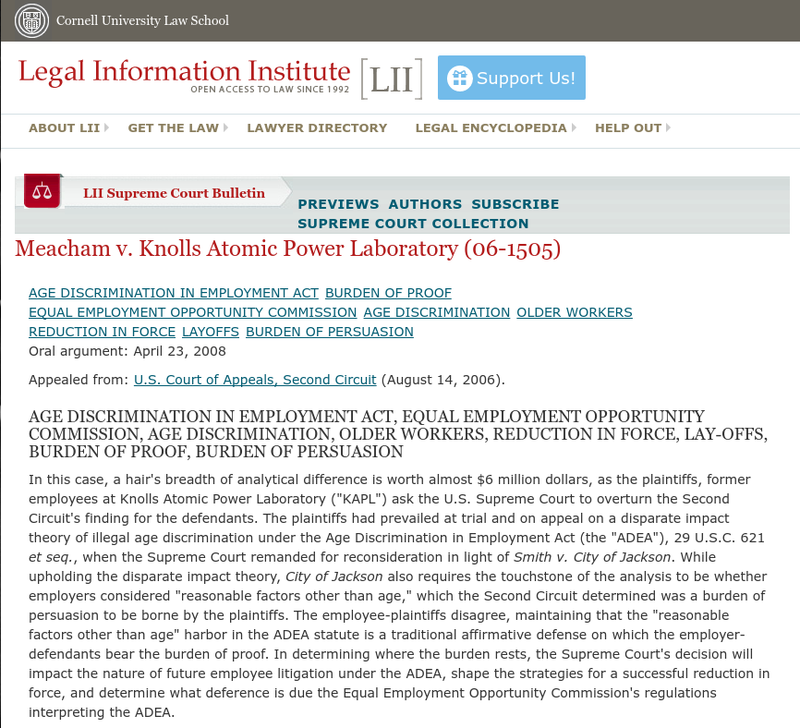 You can find the most significant ones at this link: EEOC Selected Supreme Court Decisions. there, and send an e-mail from their @intel.com account to confirm it. If you are an employer and looking for a qualified candidate to fill a job, please leave a comment under any of the articles in the Job Opportunities section. Our editors will receive a notification of your message and if approved, your job details will be published on this web site. insurance, unemployment, and so on. To protect people's privacy, at this time only those who were laid off or taken a VSP are included. For anyone who intends to learn Python from scratch or enhance their programming skills by developing a small project, I highly recommend installing Anaconda Python provided by Continuum Analytics at this web site. The package is very complete and is provided free of charge. When I was the systems software architect of the Electrical Validation department, we had many compatibility issues and endless number of package conflicts that stemmed from the absence of a reliable package management system. It was also very difficult to exchange code and track the dependencies of software components that were developed in python by more than 300 engineers, located in many sites around the world. During my investigation of the systemic problems that we faced daily and while looking for a way to solve these problems, I encountered Anaconda Python. After introducing it to some of my close colleagues, they became religious fanatics about using it. The nice thing about Anaconda, is that it is a completely self standing subsystem, which does not depend on any other system applications or system components, since it includes the "kitchen sink" for everything Python. In the Windows environment this has a significant advantage , because the Windows Registry is not used at all and consequently, limitations imposed by Registry mismanagement are non-existent. The Anaconda package does not require any formal installation, you simply download the zip/tgz file and unpack in a folder of your choice. This applies to all OS versions, including Windows, Linux, and OS-X. Both 32-bit and 64-bit versions are supported. An internal package manager is used to maintain all software components current and compatible. The Anaconda environment also allows easy switching among different Python versions (2.x/3.x) if such an issue is of importance to your application. The provided IDE is Spyder-- an excellent development and debugging tool that includes an iPython execution environment, which is very nice for "on the spot" test running and debugging of your code snippets. Anaconda also has very good support for developing Python "Notebooks" with Jupyter. Since in my department we used a lot of scientific calculations, as well as "big data" processing, we found Anaconda to be the most friendly Python development environment that allows a developer to focus their efforts on development and production, rather than chasing compatibility problems. A list of all the packages included in the most recent version of Anaconda is included at this link: Anaconda 4.0.0 package list . Questions that we received from various people indicate that there is general misunderstanding of what Unemployment Benefits are all about. For the benefit of those of you who were never exposed to the subject we put a summary below. Please notice that Unemployment Insurance (UI) was put together to help workers who lost their job mitigate the financial effects of job loss. There is no shame and there should be no stigma associated with claiming what is legally and rightfully yours. Even of you were not aware, UI was part of your overall compensation package since the first day of your employment. The money used to pay Oregon unemployment insurance benefits comes from Oregon employers’ state payroll taxes. The taxes collected are deposited in a trust fund used to pay unemployment insurance benefits to unemployed Oregon workers. The money to administer the unemployment insurance program comes from a federal tax, created by the Federal Unemployment Tax Act (FUTA). The federal unemployment tax is assessed on all for-profit employers and is paid to the Internal Revenue Service. Unemployment Insurance benefits replace part of the income lost when a person becomes unemployed. This softens the impact job losses have on communities. Workers maintain purchasing power to support businesses in the area where they live. Qualifying A claim is based on a one-year period known as the base year. The base year is the first four of the last five calendar quarters completed at the time the initial claim is filed. Second: if an individual does not qualify the first way, a person may qualify for benefits if he or she has wages and worked at least 500 hours during the base year of employment subject to unemployment insurance law. Benefit amounts are set by law as a percentage of the wages received during the base year. The weekly benefit amount is 1.25% of the total base year wages but with a fixed lower limit of 15% and an upper limit of 64% of the state average weekly wage in covered employment. A claim lasts for 52 weeks that make up the benefit year. This is the 12-month period beginning with the week they first file for benefits to set up a claim. Claimants may receive up to 26 weeks of benefits within the benefit year. Minimum claims may have fewer than 26 weeks available. They cannot file a new claim until after the 52 weeks. Extended benefits may be paid beyond the 26 weeks during periods of high unemployment. Many of us would like to move on and look into the future. However, the layoff selection process taken by Intel Corp. suspiciously smells of age discrimination and the age group composition surfacing from the OWBPA reports indicate that a disproportionate number of people have been selected for layoff based on their age. Since filing with BOLI/EEOC does not involve hiring an attorney and the filing process is rather simple, those of you who have evidence indicating that you have been discriminated for your age should look at the BOLI/EEOC complaint filing process very seriously. by Intel Corp. for age, gender, or similar cause, you are encouraged to file a complaint with BOLI/EEOC. By doing so, you will be paving the way to guarantee better enforcement of your civil rights and employment standards, as you continue to seek employment after your Intel career comes to an end. The Federal agency dealing with employment discrimination issues is the Equal Employment Opportunity Commission (EEOC). Typically, there is a division of labor between the Federal agency (EEOC) and the corresponding state agency. The relevant state agency is accepting and sorting out the filed complaints and when an original complaint meets the required judicial standard, the state agency would typically file that complaint, on behalf of the original filer, with the EEOC.The result is that a state agency has jurisdiction in all 50 states and is not limited to a single jurisdiction, as would typically be the case in a regular civil court case. In their "Mobile Wars" column Quartz is covering the latest Intel Corp. layoffs while asking important questions. To quote: "When Intel announced layoffs of about 3% last year, CEO Brian Krzanich had this to say: ‘This is the way a meritocracy works.” One wonders: To whom do those words apply when contemplating Intel’s failure in the mobile world?" This is the first of two discussion threads, SW Professionals Updating Their Skills. A second thread will be about Non-SW Professionals adding some Software skills. What languages/tools should I be targeting? In general, there seem to be a few top-level trends right now. - "Full Stack" is a loaded phrase. Been hearing it a lot lately. See below. Basically, do you have the skills to build and get our Product all the way to market. You will have to ask someone AND look at specific job listings, to see what a company thinks is most important. For instance,I have a company I'm looking at, and they are very big with Microsoft and .NET right now, but also want to get into the IoT space which is lots of Linux. If I got that job, I would then be influencing that new direction. But they may not be fully aware of that tech trend. TIP: When I am interviewing for a position even within a company, one of the things I ask is "What is your Tool Chain? I'm just looking for an overview". When it is the Developer Manager or a Developer, they can usually answer you in depth. If they can't, that might be a red flag! This is also the time to really evaluate THEIR competency. QUESTION: What do others on this list feel are the top SW Trends we should be aware of? A full-stack programmer is a person who is comfortable working with all the technologies required to get an idea to a finished product. This guy is familiar with all the layers of software development. He has fair knowledge of Networking, Database, User Interface , API, Security etc. Two guys asked me on May 24 Meetup, "What do I do when Recruiters ask what Certifications I have? And I have no answer for them!" First, don't lie. If you have none, say none. I have none. 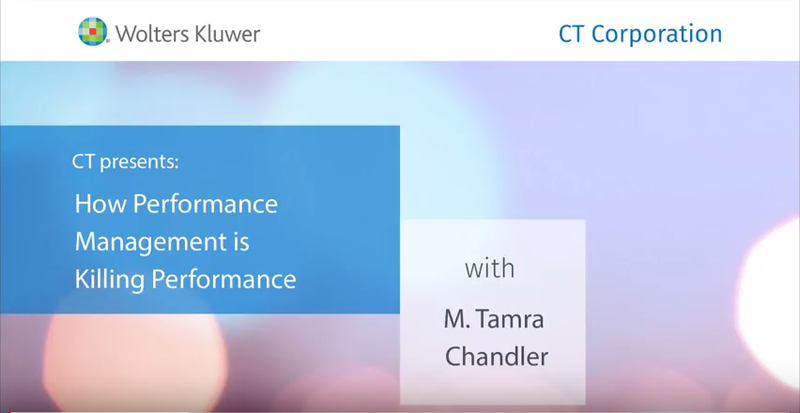 Second, ask back what Certifications are they looking for right now? 9 times out of 10, they don't know. Understand that Recruiters are trying to match tabs to slots, and having some specific Certifications will help the Recruiter do matches on their job search engines. If they do have a specific Certification for a job, then you might have something in your experience that is equivalent. The two guys who were talking to me, both had extensive Red Hat experience, just not the RHEL Certs. I told them to emphasize that in their resumes, that the experience was equivalent to some specific RHEL Certs. Maybe summarize that by looking at existing Certs and taking their titles to describe your experience. IMHO, Certifications are the latest version of the "Bring Me A Rock! "*** game. Unless your employer has paid for the Certifications, don't go out and pay for them yourself. Certifications are also used by companies as additional revenue, usually tied to specific products or product lines, and usually have a life span good only until the next version change or the product EOLs. That said, I don't devalue any training. I've learned and forgotten lots of tech in my career, and it is all useful if it taught you something. A new abstract way of looking at a problem, teaching the background of an underlying technology, finding workarounds to tough problems. I believe that all knowledge is useful, but then I'm also a Liberal Arts undergrad! We are indoctrinated to believe all knowledge is useful! ***USA Cultural metaphor. Two people need a rock. One person keeps bringing rocks over and over, and the other keeps rejecting the rock as being not right for some particular feature, but never specifies what except thru trial and error. Alternative versions include placing furniture in a room with your Significant Other, or that classic: Feng Shui. I have no idea about these, whether they are good or not. They are listed as being at the June 1 Job Fair, so caveat emptor. Anyone on the list have experiences with these? - Do you have and use Notepad++? Is it on your USB key? If you are doing stuff on Windows, you need it. I especially like that it can preserve Linux line-breaks. I also use the Compare plug-in, which can diff two files. Useful for me. - I have my own bin.win32/ and bin.linux/ directories. Scripts, tools and other stuff I've collected over the years. I basically copy them into whatever system I am long-term on, and I've got my basic toolkit ready to rock. - Code Snippets and Formulas - Do you have them in a file/spreadsheet/db that you can access? Honestly, I am always looking up a for loop on Bash, Windows and Perl. The syntactic sugar is often close, but not right for each. Don't get me started on digging up workable examples from the MySQL documentation. Welcome to the PDX-TIE.ORG web site. Note that this web site is freshly minted and it might take a while to organize and populate with content. Any member of our organization is welcome to send me a request for publishing blog entries or any other content that is of interest to our community. Please note that your content is exposed to the public and therefor you should avoid entering confidential details.